I think I did a healthy amount of riding this month. My longest ride was a 50 miler on Deets, my Surly Cross Check. I rode to work 19 times, 10 on Deets, 5 on Little Nellie, my Bike Friday New World Tourist, and 4 on Big Nellie, my Tour Easy recumbent. I rode to four Nats games (and drove to three more with my kids). The Mule got the month off for good behavior. For the month, I racked up 684 miles, with 400 on long-neglected Deets. It turns out that my Cross Check may be my favorite commuting bike. For the year I’ve ridden 5,239 miles. 3,367 of those miles came from riding to and from work. 832 came from my bike tour. I’ve ridden to work 115 times. The biggest accomplishments came in the form of milestones. First, I hit 100 commutes at the start of the month. Then, Big Nellie hit 40,000 miles. Little Nellie got jealous and hit 17,000 miles. I capped it off on my birthday when my four bikes together crossed the 100,000 mile mark. September holds two bike events and a bunch of baseball games. One of these days I might actually go on a hike. And somewhere in this mess of activity I might actually ride or hike with someone other than my own self. 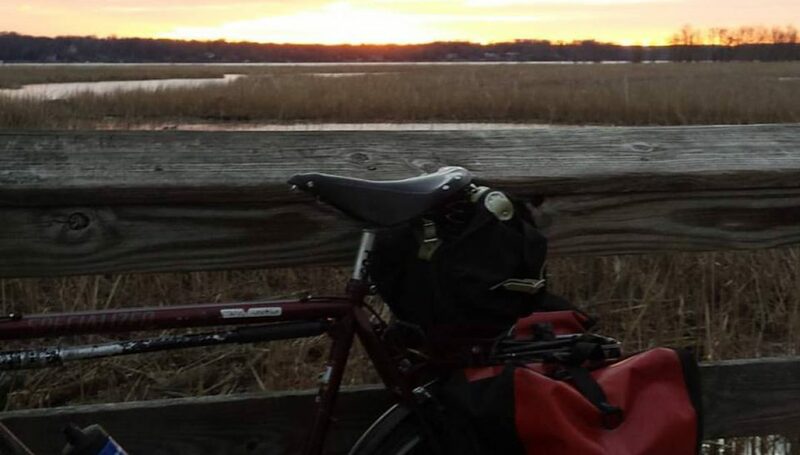 Posted on August 31, 2016 by rootchopperPosted in #bikedcTagged #bikedc, Cross Check, New World Tourist, Surly, Tour Easy.